After finding the brewing in a industrial section of Fairfield, walking into this place was exactly what I would expect from an up-and-coming brewery. It was bare bones, only what is needed, and the captain of this ship is a guy named Rick Reed. 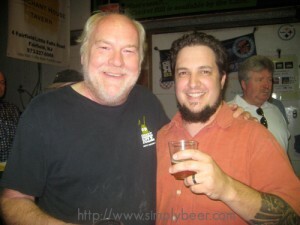 I know I’m passionate about beer, I can talk to people for hours about beer, but this man has more outward passion for what he does then anyone I’ve meet and it comes through in this brewery. Every Friday evening from 5-7pm, the Cricket Hill Brewery opens its doors for a “tour” and tasting. For 2 dollars entry fee you get 5 samples of their brew. Tonight they had on tap their East Coast Lager, Porter, American Ale, and the Jersey Summer Breakfast Ale. Aside from the excellent beer, you’ve got to see Rick Reed’s (industry Notorious) Speech, he basically tells it as it is as far as I’m concerned. 2. NJ Residents/Drinkers, demand Local Beers. 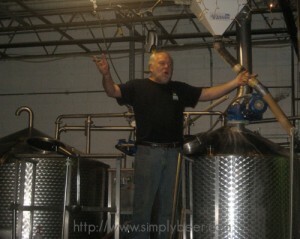 Also in tonight’s “tour”, Rick announced the creation of a new Brewpub in Newark NJ… YES!!! NJ only has 13 breweries, i think Philadelphia has more in their city limits. It is no secret, New Jersey makes it extremely difficult for a brewery to operate. I sure hope this changes and it is another issue the Rick is passionate about. Enough about the tour. Let me say a couple words of the beer, since many of the local bars around here carry the American Ale and Lager, I used my allotted samples and had a couple of the Jersey Summer Breakfast Ales. It was very similar to a wit, with orange and coriander, very refreshing a good session ale. The nutty and smokiness of the porter was delicious. As one of my favorite styles of beer, I enjoyed the Porter, I can’t wait to taste the bourbon barrel porter. When I walked out of this brewery, I felt as though this is a bunch of dedicated people who want to make quality beer, but also change the political landscape in New Jersey for craft brewers.